In 2017, the residential construction project Residence Garden Towers was completed in Zizkov, a popular and fashionable district close to Prague city centre. 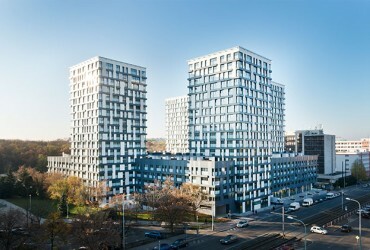 Its unique design ensures that the building fits in perfectly with the urban district: the lower of the 21 storeys were built on an almost square base, from which five towers rise up nearly 55 metres into the air. From the very top floors, residents are offered a spectacular view of Prague's old town and the castle. Alongside the metropolitan flair, a unique system of roof gardens and terraces as well as the landscaped courtyard with a children's playground provide residents with exclusive quiet zones for additional comfort and enjoyment. 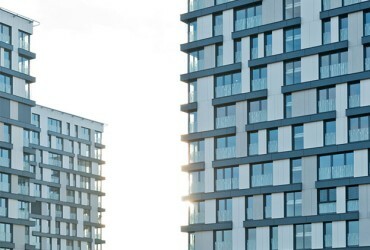 The lower storeys are designed as commercial units, while the remaining approximately 630 units offer residential space for up to 1,400 people – from one-room flats to spacious four-room apartments. All apartments feature modern and high-quality fittings, including aluminium window systems from heroal, as well as luxurious bathrooms, wooden floors and "smart living" options. The environmental footprint of the material aluminium is also a central sustainability factor. 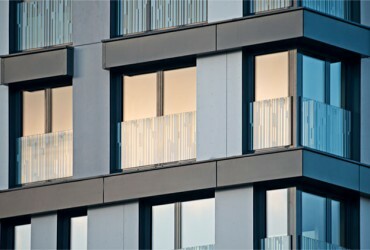 The energy-efficiency of the installed elements with reduced material use is also taken into consideration: heroal uses up to 85% recycled aluminium in the production of the complete system portfolio, ranging from windows, doors and curtain walls to roller shutters, sun protection and roller doors. That way, 95% less energy is used compared to using newly produced aluminium, without any loss of quality. Aluminium systems are quite durable. This is due to their high weather resistance, natural protection against corrosion as well as high material stability. Even when opened and closed a multitude of times, there is minimal wear and tear. The commercial units on the ground floor were fitted with heroal C 50 façade in a transom-mullion construction. The system meets highest standards in terms of effective heat insulation combined with narrow profile face widths of 50 millimetres – large glass surfaces and high transparency could thus be realised without any problems. The door system heroal D 72 is ideally suited for heavily frequented areas – a worthwhile investment for one of the largest residential construction projects in Prague.